We display art exhibitions... about five each year. We don't open full time because each show takes a while to prepare, so sometimes we hibernate for a bit, while in preparation for the next exhibition. We like to think of our shows as an event. Mark your calendar! Each lasts about 4 weeks and when we’re open we’re open every day, 11am - 5pm. Our goal is to bring great regional artists to you, and to promote, nurture and support our artists in their work. 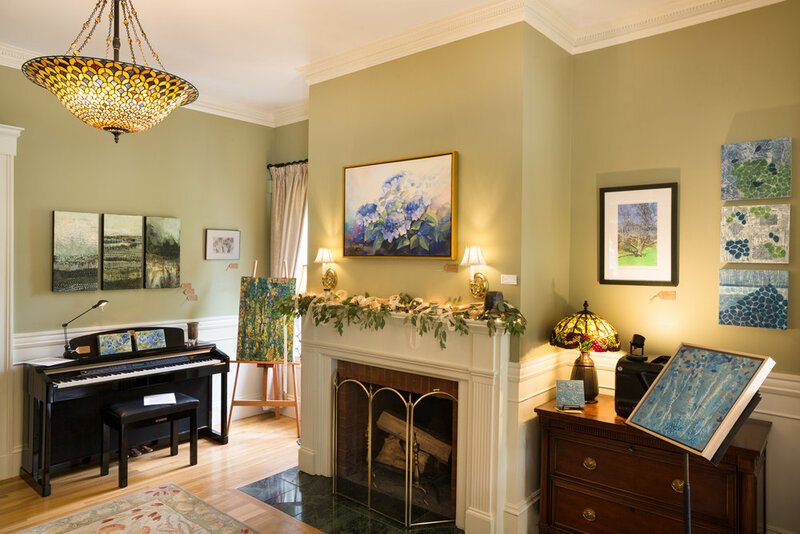 Our artists are well-established regionally, and live & work here in New England. Many of them are award-winning, with work in private and corporate collections locally, nationally and internationally. We're also excited to show the work of emerging artists we've newly discovered. 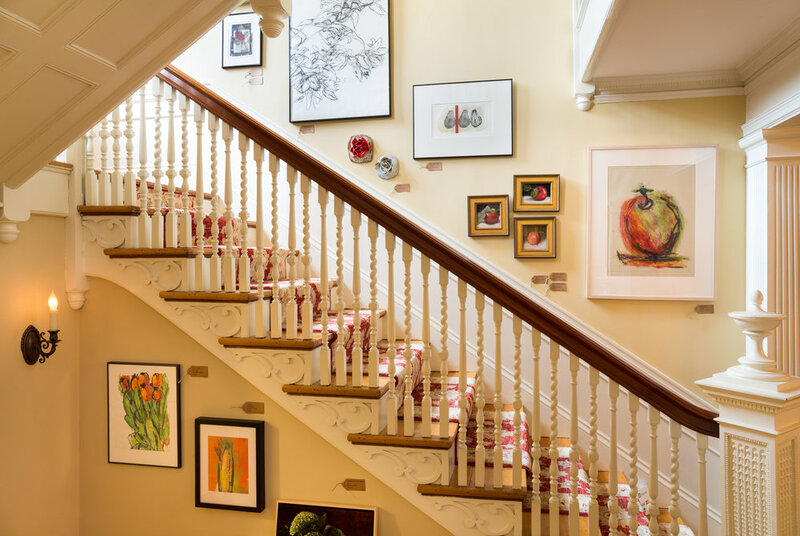 Based in Lexington, Massachusetts, in the heart of New England, gallery twist's short-term exhibitions of artwork are displayed on two floors of an historic house. 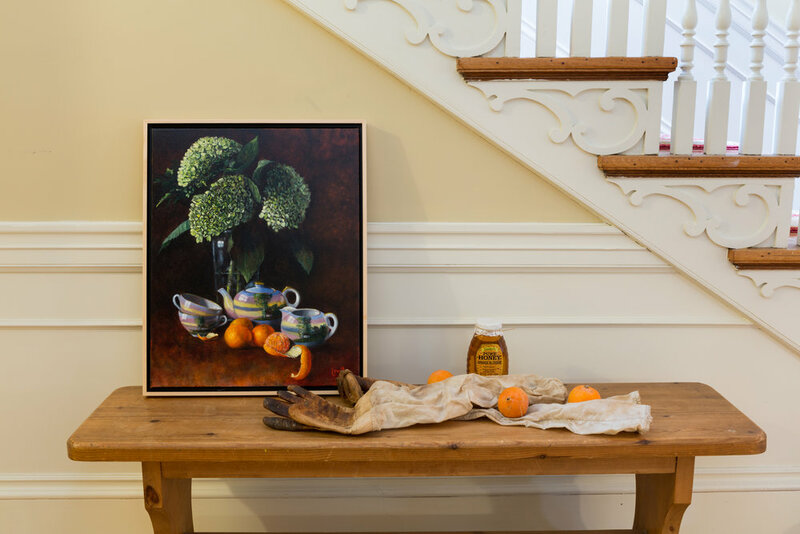 Here, you can easily imagine a newly-purchased piece of art settled into your own home or workplace. (By the way, we've found that both traditional and modern art look great in a historic house!) We are within very easy walking distance of Lexington center's inn, shops and restaurants. We show an eclectic mix of art, because that's what we enjoy. Our artists work in varying styles, sizes and media, 2D and 3D. Work is available at a variety of price points. The gallery's selection includes original watercolor, oil, and acrylic paintings as well as encaustic works, pastels, fiber art, printmaking, collage, mixed media, ceramics, sculpture, woodwork and photography. Artwork is exhibited in group and solo shows throughout the year. We look for work by unique, gifted artists that reflects conviction, intention, mastery of technique, and authenticity. We pick what we love! By opening in such a unique space for exhibitions, gallery twist provides a place for visitors to truly enjoy fabulous art, as well as conversation and connection with artists. 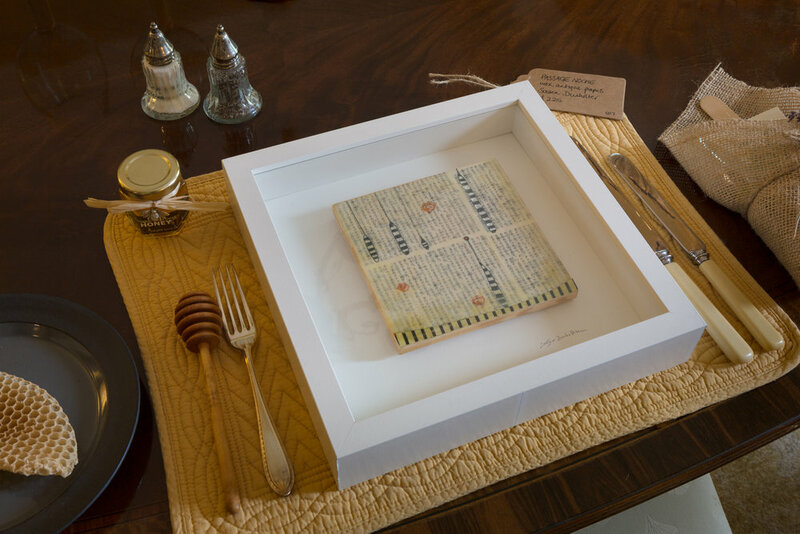 We’ve become known for the way we display the work - sensitively and thoughtfully. Whether you visit in person or online, we offer you a warm welcome, a lift to your spirit and a feast for the eyes. We are always happy to answer questions and assist in sourcing the right art for your specific needs. We can also offer recommendations for other art services: framers, photographers, art teachers, artists willing to do commissioned work, and so on. Moving from England to New England 14 years ago, it is kind of ironic for 'Brits' Gillian and John Ross to be found living and working just a stone's throw from Lexington's Battle Green... site of the first shot fired leading towards American Independence. We love living here. We only occasionally wear redcoats. Having been an artist-member of the 'Depot Square Gallery', which was well-known and loved in Lexington for many years until 2009, Gillian and John decided to open gallery blink, (now gallery twist) fulfilling the need for more exhibition space to showcase and sell the work of some of the many talented New England artists – and to provide visitors with the opportunity to enjoy and purchase artwork in a welcoming and un-intimidating environment. John's background is in investment communication, and while his role is partly related to the business side of running a gallery, he has a great eye and is also quite involved in the curating and hanging process. While serving as Gallery Director at Lexington's Grace Art Gallery for the past ten years, and in her other roles on the boards of Lexington Open Studios and the Monotype Guid of New England, Gillian has juried, curated and presented many art exhibitions. Through this experience, together with her involvement with many other art organizations, and as a practicing printmaker/painter, she has developed a wealth of connections with many of the area's finest artists. So together, John and Gillian are now delighted to welcome you to gallery twist. If you're reading this, you are likely an art lover and art appreciator. We'd welcome the opportunity to be part of your journey, as you develop your love of and appreciation for art. As a unique expression of the human need for creativity, art has power to inspire, enrich and impact daily lives. We would love our gallery and the artwork here to become part of your story. 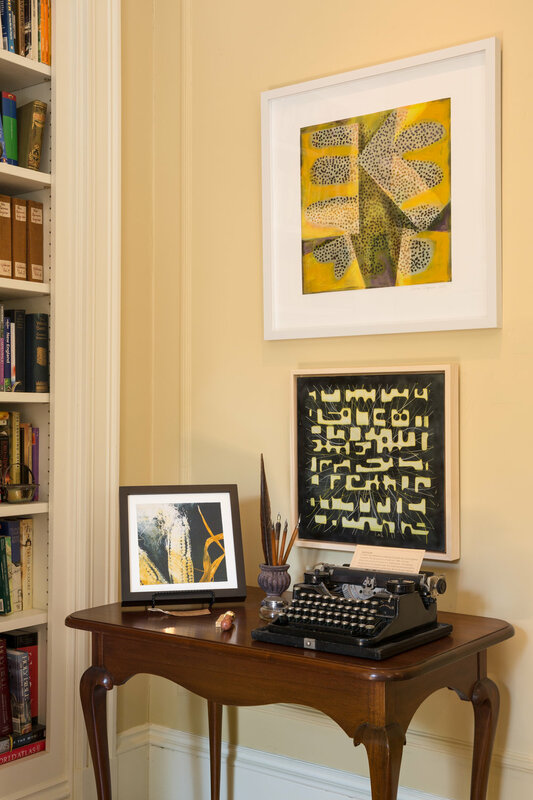 Let us know if we can be of service in any way - Perhaps a home or office visit, to help provide artistic ideas to beautify your space, or assisting you in finding a specific piece of artwork for that favourite spot where you want to enjoy it. We are here to help!